Why travel with a boutique company? You have always traveled on your own. Maybe you traveled Europe staying in hostels, maybe you hiked the Appalachian Trail or maybe you book trips for your family every year. If you have ever dreamed of adventure trekking in Nepal? Join us. We take care of everything, simplifying your trip so you can have fun! Boutique companies are intimate and focus on creating a highly personalized trip. We talk to everyone who is interested so that they pick a trip that is perfect for them. Not only do we work with local guides; we immerse ourselves in their culture. We get to know their families, play with their kids and create friendships that last a life time. 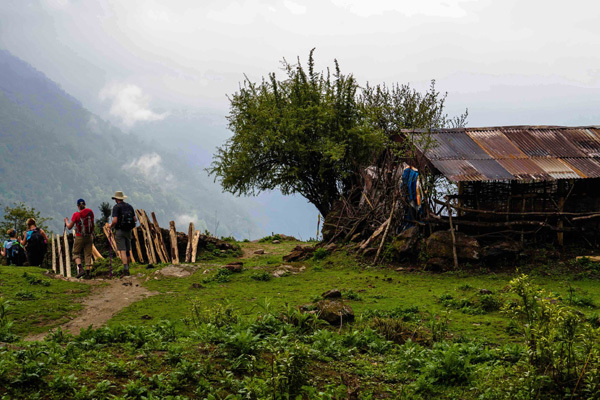 We share local Nepalese meals that we learned how to cook side by side on a wood fire stove. We give back to the communities we trek through by volunteering in local school, donating lanterns or just helping out on the farms. Whether traveling alone, or with a friend it can be scary. We make sure you are always comfortable, supported and that you know you can always ask for help. You are not going to get lost in a crowd. There is always a shoulder to lean on, someone to laugh with as well as opportunities to enjoy nature solo as you walk amongst the most majestic Himalayan peaks as part of the adventure travel in Nepal. Treat yourself, let someone guide you through the Himalayas as you make new friends, experience the Nepalese culture first hand as trek.